To launch SALON-LONDON, a site for reading and responding to the present through women's experimental writing, we will be hosting Redell Olsen in conversation with Carolyn Pedwell. 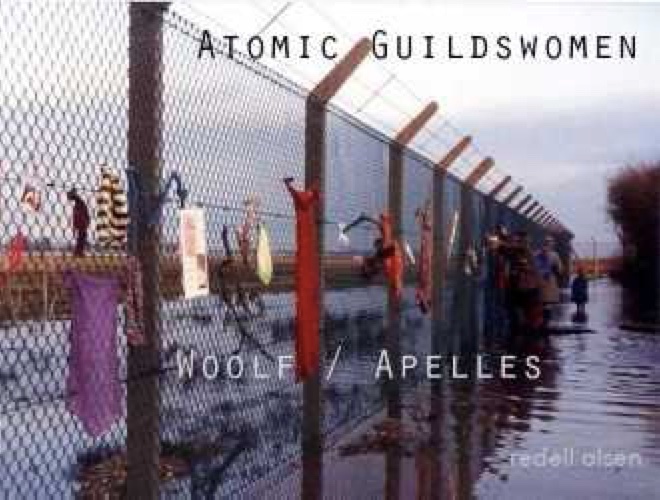 Redell Olsen will read from and introduce two recent works: ‘Woolf / Apelles’ and ‘Atomic Guildswomen’. Carolyn Pedwell will give a short paper on digital culture, intuition and new social movements. Admission is free. To reserve your ticket, click here. Redell Olsen’s poetic practice comprises poetry as well as texts for performance, film and installation. Her publications include Film Poems (Les Figues, 2014), 'Punk Faun: a bar rock pastel' (Subpress, 2012), 'Secure Portable Space' (Reality Street, 2004), 'Book of the Fur' (rem press 2000), and, in collaboration with the bookartist Susan Johanknecht, 'Here Are My Instructions' (Gefn, 2004). Her work is included in Infinite Difference: Other Poetries by UK Women Poets (Shearsman, 2010), I’ll Drown My Book: 'Conceptual Writing by Women' (Les Figues Press, 2011) and Out of Everywhere 2: Linguistically Innovative Poetry by Women in North America & the UK (Reality Street Press, 2016). In 2017 she published two bookworks Smock and Mox Nox. She has also published a number of critical articles on contemporary poetry and the relationship between contemporary poetics and the visual arts. In 2002 she set up the influential MA in Poetic Practice at Royal Holloway which she still runs as part of the MA in Creative Writing. From 2006 - 2010 she was the editor of How2, the international online journal for Modernist and contemporary writing by women. In 2013-14 she was the visiting Judith E. Wilson fellow at the University of Cambridge. In 2016-17, in association with other members of staff from English and Modern Languages at Royal Holloway, she led the HARC funded project ‘Nature and Other Forms of That Matter’. She is Director of the Poetics Research Centre at Royal Holloway. Carolyn Pedwell is Associate Professor in Cultural Studies at the University of Kent, where she is Head of Cultural Studies and Media. Carolyn has been Visiting Fellow at the Department of Gender and Cultural Studies, University of Sydney; the Centre for the History of Emotions, Queen Mary University of London; and the Gender Institute, London School of Economics. She is the author of Affective Relations: The Transnational Politics of Empathy (Palgrave, 2014) and Feminism, Culture and Embodied Practice (Routledge, 2010). Her new book, Transforming Habit: Revolution, Routine and Social Change, is under contract with McGill-Queen’s University Press. Carolyn is also an Editor of Feminist Theory journal. To learn more about the subject of her talk, click here. S A L O N - LONDON is organized by Georgina Colby and Susan Rudy. Our launch has been funded by the Institute of Modern and Contemporary Culture at the University of Westminster, the Department of English, Linguistics and Cultural Studies at the University of Westminster; the Centre for Poetry, Queen Mary University of London, and the School of English and Drama, Queen Mary University of London.